Brazilian canines allowed their people to dress them in masks and costumes Sunday for a four-legged Carnival just days before the humans will hold their own party. 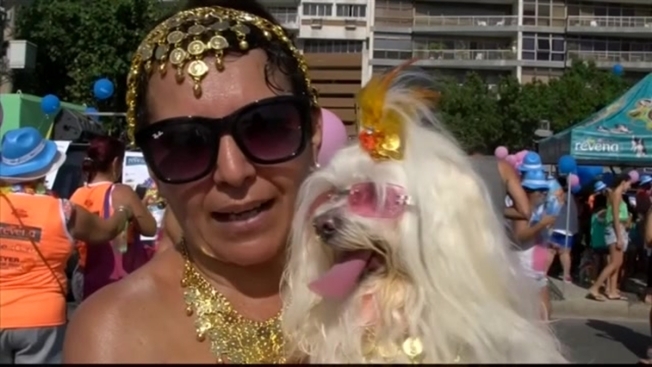 A white-haired lap dog was dressed as a court jester for the gathering of dozens of pets in Rio de Janeiro. 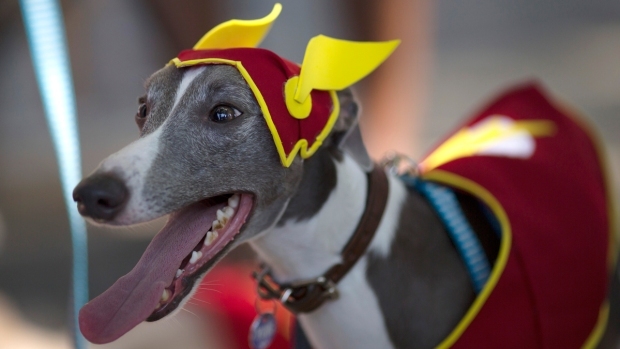 A medium-sized pooch was the superhero Flash with yellow wings on the side of its head. A tiny black dog wore insect-like antennas. Two beauties with long white hair sported the Olympic rings on their heads. The celebration started with the Banda Vira-lata, which means "Street Dog Band" in Portuguese, announcing the beginning of the festivities. People gathered with their dressed-up dogs at the edge of Copacabana beach for the annual "blocao," or block party, for pets. While the band played a samba, the four-legged carnival celebrants paraded under Rio's blazing sun. "Always by their owner's side, always a loyal friend .... arf, arf, arf," a band member sang. "The 'blocao' is animal!" the singer added in the song describing how great the party was. People strutted by with dogs costumed as heroes such as Zorro as well as wizards and bees. During the two-hour pet parade, the pooches had the chance to play with their canine friends while the samba band members sang: "It's carnival and the party is animal!"